With the UberHorn project underway, it’s time for another project in the Sax ProShop. During the initial phases of the UberHorn project, we made mandrels to pull bodies and necks, and a draw bench big enough to pull a bass saxophone. Once we started pulling necks on our new drawbench, the next step was to learn to bend them. Once we bent them with success, we decided that we needed a couple necks for horns we have in the shop. We made mandrels, pulled the necks, and bent them. Now, the world has seen that we are making necks and everyone wants one. This series of events spurred The Neck Project. The Neck Project is a perfect one for the Sax ProShop. The Sax ProShop is a pioneer in tuning saxophones using neck taper. For years, we’ve altered necks to fix intonation (specifically octave spread) and improve horns for players. We have a thorough understanding of the tonal and pitch differences that can be implemented through alteration. So making necks from scratch is the next step. So now The Neck Project needs a mission and a goal. We’re hoping to truly know and understand what, if any, tonal differences various metal types have on saxophone tone. We’re also curious what various thicknesses of metal will do to the tone of the saxophone. 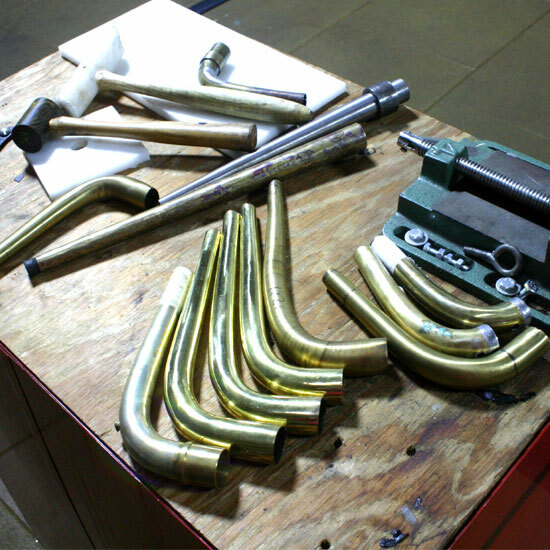 There is also a question of brass hardness, or material hardness. The shape of the neck is interesting to us. How will changing the shape affect the tone and how will it affect the taper? Specifically will a different mandrel need to be made if the neck’s future is to be bent in some crazy fashion? Also, can we make replacement necks for any instrument? To achieve this, we will have to have a keen eye on consistency as well as a large volume of testing results.